This display case contains miscellaneous glass to metal matched seal headers used for transistors, mostly variations of JEDEC TO-5 and TO-18 packages. 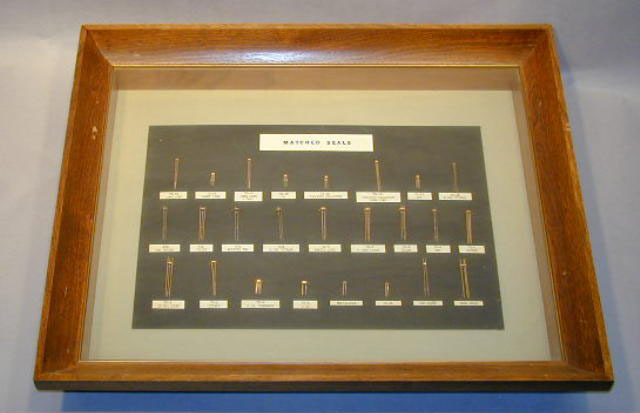 This display was built to illustrate the wide variety of matched seal transistor headers made in Hermetic Seals for use in the Semiconductor Group. Although JEDEC registration numbers were issued for the variations in length and number of leads, TI tended to use the nomenclature shown internally. For these types, Hermetic Seals produced 100% of the TI requirements. The display probably was built in the mid 1960's. Related material in collection: G00277, 279, 288-90.